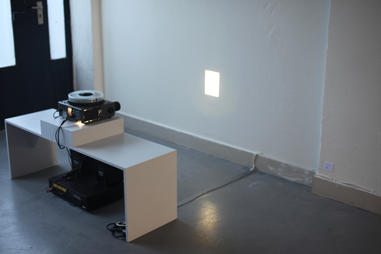 Photos of slide and sound installation, duration 9 min looping. 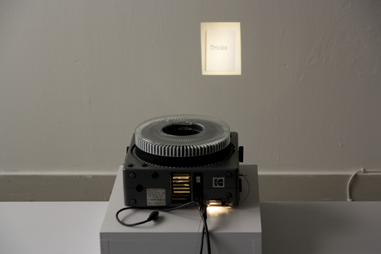 Material: Slide projector, Cd. player, loud speakers, and wooden bench. This slide projection shows sequence of 80 playing cards containing a single word, this accompanied by recordings of the same words spoken aloud. The spoken and projected words do not match. Where the ability to derive meaning from the relationships between the words appears sporadically, attempting it is frustrated as meaning disappears in the endless combination of the words, exhausting the words and language as such.